It's Asian children size ,may smaller than US/UK/EU size. Please check our size chart below (**DO NOT refer to "Size Chart" link**). How to choose a right size? 1. Normally, just choose the size based on the children's height. 2. For child with overweight or large bust, please choose the robes with 6"-7.5"(15cm-20cm) LARGER at BUST than children's. 3.If the height and bust information for your girl is not available, one size larger than usual is recommended. Hand wash only in cold water,separately. DO NOT BLEACH. Hang dry. Iron/Steam on low heat only. Material:100% Polyester Satin.Luxurious soft and light-weight,silky feel and look,comfortable and relaxed. 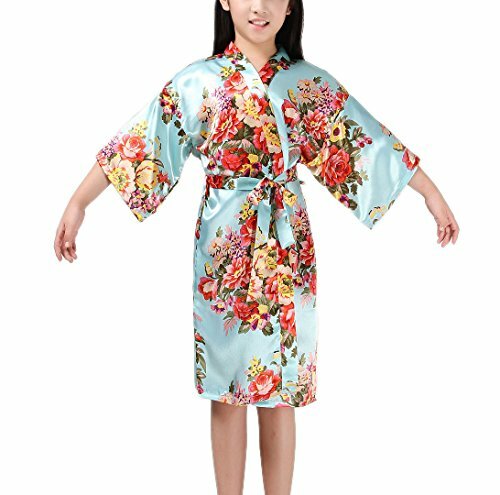 With interior tie and exterior belt loops.Bathrobe Features Belt With Loops On Outside and Dual Ties Inside To Secure Firmly - More Contured Fit Than Standard Kimono Robes. Printed with beautiful floral pattern.The smooth style is detailed with a single initial,making it a perfect bridal shower or wedding present. Perfect present for flower girls,junior bridesmaid,mini bride;Great for weddings,bridal party,gifts, birthday,vacation,spas,balls,sleepover party,Slumber Party,prom,daily use and so on. Smaller than standard US sizes.Recommended to order one size up.Detail Size information reference product description. If you have any questions about this product by Mobarta, contact us by completing and submitting the form below. If you are looking for a specif part number, please include it with your message.